Approximately 289 million americans, 89% of the population, connect to the Internet monthly, either via smartphone or PC. 91% of them consider the smartphone their primary device and 73% consider a laptop their secondary device. The number of Internet users is increasing in the whole world, it is inevitable. Unfortunately many people are not protecting their eyes while using these devices. The light blue-purple or blue-violet is the one that has the shortest wavelength and, therefore, is the one that has more energy. Blue-violet light or high-energy visible light can cause fatigue and visual stress , in addition to the early onset of AMD (Macular Degeneration Associated with Age), one of the leading causes of blindness in the world. Blue-violet light negatively affects the cells found in the macula, a light-sensitive tissue at the back of the eye. It is important to know that the cells that make up the macula do not have regeneration capacity. AMD (Macular Degeneration Associated with Age) is a degenerative pathology of the central area of ​​the retina, or macula (a very small area located at the bottom of the eye), which progressively degenerates the cells and the pigment epithelium of the retina. In the center of the retina is the macula, a tissue sensitive to light located at the bottom of the eye. The cells that compose it do not have regeneration capacity. Spending too much time in front of the screens speeds up the disappearance of these cells. Those who suffer DMAE present problems in the central vision that become more acute over time, making it difficult or preventing them from doing everyday activities such as reading. This pathology is common among people over 60 years of age and, therefore, it is said to be "associated with age". The DMAE can be of two types, dry or wet. The first appears when the blood capillaries located under the macula are weakened. The consequence of this is blurred central vision. The second, the wet one, is less frequent than the dry one. It is caused by the appearance of new very fragile vessels under the macula. Those who suffer from it perceive the straight lines wavy or crooked. 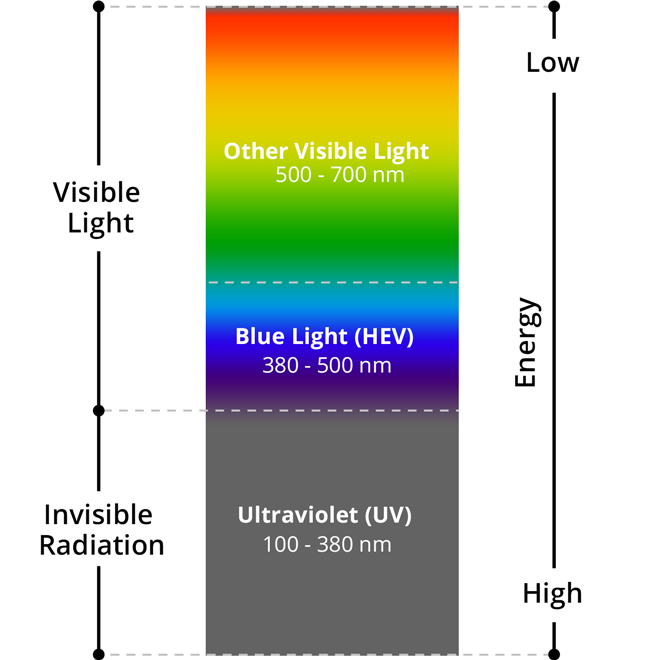 It is important to limit exposure to blue-violet light emissions from artificial light sources. Fatigue and visual stress. It appears when the eyes have to see in conditions of little or lots of light and, also, when they have to focus for a long time to see, for example, texts, videos or images on a Smartphone. The Computer Visual Syndrome (SVI) is a visual pathology of recent appearance that affects one in seven people, which usually appears in the form of red, dry, tired eyes, headaches ... From the National Institute of Occupational Health and Safety in The United States warns that using a computer three or more hours a day increases the chances of SVI appearing; this means that the risk is greater among those who work in front of a screen or with multi-screen environments. Alteration of circadian rhythms. The screens emit blue-violet light so you can see them even in the sunniest hours of the day. But, at night, your brain is confused by this light, intense as solar, reducing the production of melatonin, the hormone that gives your body the signal to go to sleep. Put another way: the light of electronic devices can interrupt your sleep cycle , making it more difficult to sleep and stay asleep and this, in the long run, can cause serious health problems. Why so much? Because of fear. I personally would not operate my eyes and opt to wear glasses when my eyesight fails me. I am 24 years old and I do not think I need glasses for at least 10 years, but due to the constant use of the computer in my work and my smartphone outside of it, I noticed that my eyes felt tired. That's why I decided to buy anti-reflective lenses, the Uvex Skyper. I've been using them for a week and I've definitely noticed that my eyesight does not feel tired at the end of my working day. Annex 3 different lens models, less ugly haha, to those that I use that my colleagues use.